It's been a while since I participated in Bakespace Recipe Challenge (previously Test Kitchen). I didn't get to do anything for the last month's theme, Haitian recipes, and I'm starting this month cheating partially, because I made this soup a few weeks ago, but never got to post it. Then I realized it was there, ready to be shared. So here's my first entry for this month's theme: Gluten free recipes. I did a very superficial research about gluten free foods and realized it is more complicated than I thought, because apart from the foods that contain/don't contain gluten, there are those gluten free products that can be contaminated if in contact with products containing gluten. Although I'm imagining things aren't half as bad as they were a few years ago. There are whole sections at supermarkets dedicated to gluten free products. Neither I or anyone in my family, or friends, have problems with celiac disease. But I really think it's useful to learn more about it. 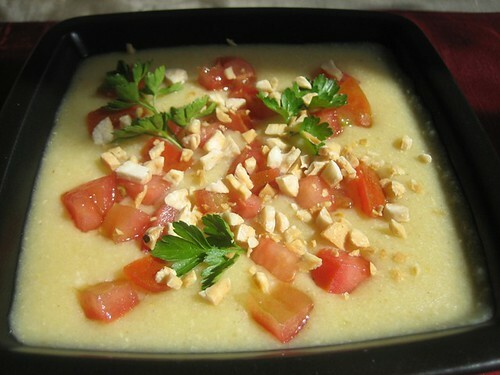 So this soup has two main ingredients, millet and lentils, both of which are allowed in gluten free diet. When I made this soup, it was simply because it is healthy, and it turned out to be tasty as well. So, as usual, when I cook something new (and in this case it was millet, although I've used millet flour before, but never the whole grain), I did a little research about it, and was really amazed because of all the positive information. Millet is technically a seed and not a grain but it is categorized as grain from a culinary perspective.) It is a delicious grain whose consistency varies depending upon cooking method; it can be creamy like mashed potatoes or fluffy like rice. Additionally, since millet does not contain gluten, it is a wonderful grain alternative for people who are gluten-sensitive. Millet is tiny in size and round in shape and can vary in color from white to gray to yellow to red. The most widely available form of millet found in stores is the pearled, hulled type. Millet is thought to have originated in North Africa, specifically in Ethiopia, where it has been consumed since prehistoric times. There is even mention of millet in the Bible as an ingredient for unleavened bread. Millet is still an extremely important food staple in Africa where finely ground millet is used to make a traditional flatbread known as injera. Since ancient times, millet has been widely consumed in Asia and India as well. In the Middle Ages, before potatoes and corn were introduced, millet became a staple grain in Europe, especially in countries in Eastern Europe. While millet has been used primarily for birdseed and livestock fodder in Western Europe and North America, it is now gaining popularity as a delicious and nutritious grain that can be enjoyed for both its unique virtues as well as the fact that it is a gluten-free grain alternative to wheat. Millet is a good source of the minerals phosphorus, manganese and magnesium. Although oats have been widely publicized for their heart-protective properties, millet is a grain that should also be included on your list of heart-healthy choices because of its status as a good source of magnesium. Magnesium has been shown in studies to reduce the severity of asthma and to reduce the frequency of migraine attacks. Magnesium has also been shown to lower high blood pressure and reduce the risk of heart attack, especially in people with atherosclerosis or diabetic heart disease. A cup of cooked millet provides 26.4% of the daily value for magnesium. This is only part of information, click on the link below for more. Rinse the lentils and the millet with water and place in medium size pot or casserole, add enough water to cover them well (about 2 cm above). Turn the heat on, and then add the sliced carrot, onion, celery and garlic. Cook for 20 minutes, adding more water if necessary, don’t let it dry. In the meantime, chop roughly the almonds and slightly dry toast them in a non stick skillet. Dice the tomatoes and chop the parsley. 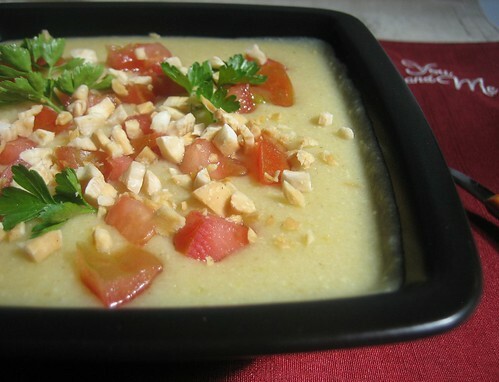 When the soup’s ready, pour it into a blender and mix well. Add a little salt and the oil. 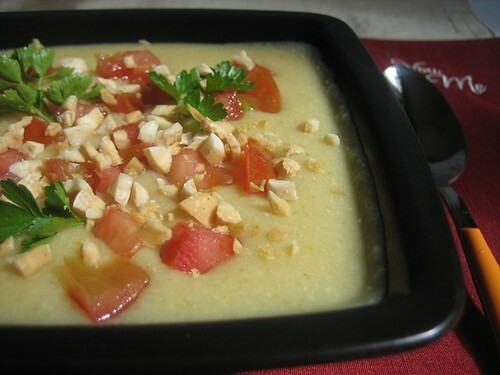 Divide the soup between 4 soup bowls and add a tablespoon of almonds, a tablespoon of diced tomatoes and a tablespoon of chopped parsley in each. Serve warm. Sciacquate le lenticchie rosse decorticate, che non hanno bisogno dell’ammollo, e il miglio e metteteli in una pentola coperti d’acqua. Accendete il fuoco e aggiungete la carota, la cipolla, il gambo di sedano e l’aglio, tutti a fettine. Se si asciuga troppo, aggiungete acqua, deve essere brodosa, ma non troppo. Intanto tritate grossolanamente le mandorle e tostatele appena. Mondate, lavate e tritate il prezzemolo e fate a dadini due pomodori. In 20 minuti la zuppa è cotta. Frullatela e aggiungete il sale e l’olio. Distribuite la zuppa nei piatti e mettete un cucchiaio di mandorle, uno di dadolata di pomodoro e uno di prezzemolo tritato in ciascun piatto. Consumatela tiepida. Isperite leću i proso i stavite ih u kuhati s nasjeckanom mrkvom, lukom, celerom, i češnjakom (nasjeckanim na listiće). Dodajte toliko vode da za par centimetara pokrije sve sastojke. Kuhajte oko 20 minuta, po potrebi dodajući još vode da se ne osuši. Juha ne treba biti previše rijetka. U međuvremenu krupnije nasjeckajte oguljene bademe i popržite ih nasuho u tavi. Nasjeckajte sitno list peršuna, a rajčice na kockice. Kad je juha kuhana, izmiksajte je u blenderu, posolite i dodajte maslinovo ulje. Razdijelite juhu u tanjure i u svaki dodajte žlicu badema, žlicu nasjeckanih rajčica i list peršuna. Možete je također držati u hladnjaku do sutradan. I adore the lentils....this one looks very healthy and delicious. Koja boja ove juhe. O ideji da ne pričam, još i sjeckani bademi,... izvrsno! *Thanks, Angie, it really was delicious. *Cristina, grazie. Oggi è una giornata proprio terribile, anche se a me le zuppe e creme piaciono tutto l'anno. *dolceamara, proprio così, anche se questa cremina sarà ottima anche d'estate, visto che va mangiata tiepida, ed è molto nutriente. Mmmmm that looks like exactly what im craving right now!! wow..u r simply great...red lentils very good for heart...we usually make rice dishes,curries with lentils..this soup is so delcious and healthy...thanks for sharing..
Da nažalost tko se nije susreo s načinom prehrane koja isključuje gluten vjerovatno i ne razmišlja kako sastaviti meni ,kod mog malenog je bila intolerancija na gluten i muku sam mučila da mu sastavim jelo ali kad sam upoznala druge žitarice tipa riže ,kukuruza,heljde i prosa za nas je otvorio nov svijet i uživamo u njima. definitivno izvrsna juha, od mojih omiljenih sastojaka :). Odlično ! !